Since beginning Chronically Vintage last spring I’ve been honoured with a score of blog awards. The kindness and generous spirit that has filled the pages of this site never ceases to bring joy to my heart, and I appreciate each and every one of the awards that I receive. Several times I’ve posted about the accolades Chronically Vintage has gotten, but others have yet to be publicly acknowledged. Before the absolute rush of the winter holiday season besieges us, I want to take a few moments and extend my utmost of deepest thanks to handful of incredibly lovely people who have passed along blogging awards to this site. I cherish each and every one of these awards, the fact that you thought of me when pondering whom to extend them to, and also to those bloggers who have passed along other awards to me before in the past. Sometimes I’m extended the same award by two (or three, etc) different bloggers, after I’ve already posted about receiving it (the first time). When this is the case, please know that I do not appreciate your own gift of an award any less. Whether I receive an award once or a million times, I enjoy and treasure it exactly the same. This post however is going to focus on blog awards that I’ve not yet written about receiving. To everyone who has ever bestowed an accolade my way, and equally to everybody who visits the humble pages of this blog, thank you from the bottom of my heart! I truly hope that those who presented me with awards won’t mind if I veer away from their “rules” of acceptance a tad. Having thought it over, what I’m going to do is share the awards I’ve gotten below, and then pass along a brand new award that I’ve just designed myself to each of those who have so generously tagged me with an award in the first places, as well as to a handful of my readers whose blogs never fail to fill me with an abundance of inspiration. If your name, or that of your blog, is listed above (as someone who gave me an award) or below, please accept Chronically Vintage’s first ever homemade award. It’s brimming with love and appreciation straight from my heart, for your kindness, friendship, and devoted readership of this site. The rules of this award are wonderfully simple. All you have to do, if you so chose, is to accept the award, stick its graphic someplace on your or site (sidebars are great for this) or post about it on your blog, linking the award graphic back to Chronically Vintage. From there on out you’re welcome to pass this award on to as many other blogs that you deem to be Chronically Fantastic! It is never easy to select people to pass along any award to, especially when there are so many top-notch blogs out there, so if you don't see your name in the list above, please don't feel left out. If you've ever visited this site, you are instantly worthy of this award and are welcome to pass it along to yourself! Scores of thanks again to those who have presented me with awards, as well as to every one of my readers, you all mean the absolute world to me, and truly are, Chronically Fantastic! Aww sweetie, I was just coming over to leave you a message of thanks for all the incredibly uplifted and wonderful comments you leave on my blog, how much I look forward to reading them because they always bring a huge smile on my face; and I see once again you have made my day with this gracious award. Thank you, thank you thank you! Jessica, you are beyond sweet and I am so glad that I have the pleasure of following your adorable blog. Aw... thank you thank you thank you Sweetie!! You've inspired me to create an award section for my blog with ample space for the awards and link backs. Great post!! Jessica! Thank-you so much for this! I was reading through all your lovely awards and thanks--you're so very gracious--and when I saw the award you created, I just got a big smile on my face--I just love the image! It IS fantastic! Then, to see my name below--I just giggled! Thank-you, dear friend, for thinking of me...I'll display this VERY proudly! Thanks for much Jessica! I really appreciate the honor. You are such a wonderful soul. You have a magical way with words and always give me so many fun places to go check out! All of your awards are well deserved. Your blog is thoughtful, kind, and a delight to read! xoxoxo Have a super weekend! What a lovely post! Thank you so much for including me! I've had so much fun sharing time with you and your wonderful blog! Hey Jessica! I just stopped by your blog now to let you that I've given you the Over The Top award, and then I saw that you gave me the Chronically Fantastic award! It means a lot to me, thank you very much! You're always so kind and sweet! Aww! Thank you :) You are awesome! How generous of you to give out your own award to so many - The graphic is fantastic, too! Joyful Friday afternoon greetings, my amazing readers, thank you each very much for your wonderful comments. I hope you know how much they mean to me - and how deeply I feel you all deserve this blog award. Many the muses of creativity and happiness smile upon you all this weekend! Awe darling Jessica, wow..I am truly honored and humbled by your personally created award! It's soo you! I simply LOVE it! You have been a great inspiration to me dahhhling, being that I am a rookie blogger :) so thank you so very very much! and congratulations on all your very very well deserved awards! You are soo very loved by all of us that follow your musings! I will proudly display my Chronically Fantastic award on my page! Once again, many many thank you's! Have a wonderfully fun filled sweet weekend doll! What a wonderful thought- I so want to be chronically fantastic and vintage minded! I will wear my badge proudly! Congrats on your oodles of well deserved awards for your lovely and insightful posts. Congratulations on your awards dear! What a lovely post. I just love the award that you've created and I'm very touched that you chose me as one of the bloggers to pass it on to :) Thank you so very much, this most definitely brightened my day. Good morning, beatiful dears, huge thanks for your immensely sweet comments. You're each deeply welcome for the award - thank you for creating the stunning, inspirational, always enjoyable blogs that you each do! Joyful wishes for a serene & wonderful weekend! I want to say a massive thank you [I somehow managed to miss this post the first time oops] your award really has made my day! I'm so delighted you not only take the time to read my own blog, but that you feel its worthy of your comments! Thank you so very much doll, your thoughts, regards and comments are always so very welcome! thanks ever so much, doll! You really are the sweetest. xoxo. Kristen, Pink Flower, FrivolousFlapper, thank you each very much for your beautiful comments. You're ever so welcome, my wonderful dears, thank your the engaging, gorgeous blogs that you each create. Huge hugs & blissful weekend wishes to one and all! Congratulations on your very well deserved awards my dear. Thank you SO MUCH for including DJA in your list for your gorgeous award. I love it, especially because you made it. @ Dustjacket Attic, you are so very welcome, my sweet friend. Your site is a chest of the most delightful photographic treasures imaginable. It's an honour for me to count you amongst the recipients of this award. Thank you for all the beautiful work you do! @ Andi, you're super welcome, sweet heart! 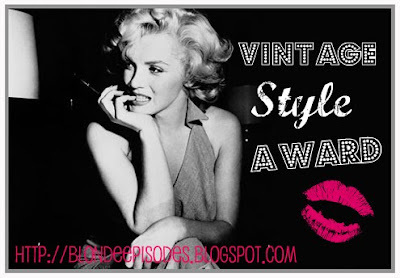 I can't begin to tell you how much your blog inspires and continually fuels my own vintage fashion fever, you deserve this award and countless others for the amazing blog, ideas and vintage outfits you share with all of us. Thank you for creating the stellar blog you do, honey!